This week, as the 50th anniversary of the Kennedy assassination passes, I've noticed that some have lamented how much the quality of news reporting has declined. They take the approach that news anchors used to report news, but now, not so much. Here's a CBS report from November 22, 1963, when the news of the shooting of the president was just breaking. 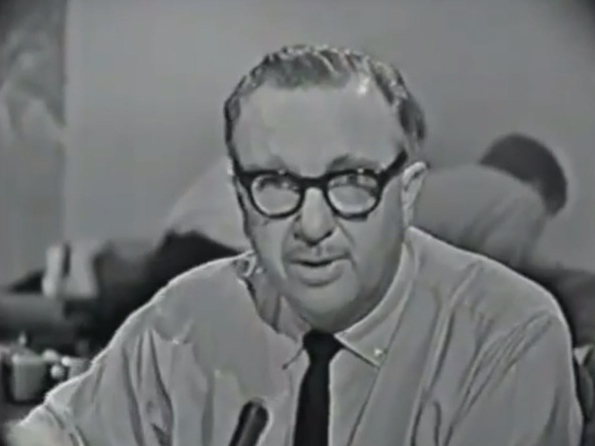 At 3:38 of this video, we hear that bastion of news reporting, Walter Cronkite, suggest who may be responsible. It might be recalled that Dallas has been a hotbed of criticism of President Kennedy and his administration by outspoken rightist groups. Only two weeks ago, ah, Ambassador Adlai Stevenson of the United Nations was in an incident in Dallas when he was besieged by pickets, er, right-wing pickets, outside the speech he made there, and he was struck in the head with a picket sign by an outraged conservative who felt we should not be in the United Nations. So, right off the bat, after word of the shooting but before the president was pronounced dead, CBS was suggesting that right-wingers were responsible. And, of course, who killed the president? Lee Harvey Oswald, a left-winger, a communist, a supporter of Castro's Cuba. It's not news to me that the news reporters always seek to blame the right for violence. It's also not news to me that it's often the left-wingers that commit the violence. Don't forget how they blamed Gabrielle Cliffords' shooting on Sarah Palin, practically while the victims were still being triaged. News reporting is much better now...Cronkite rambled on for nearly ten minutes and didn't inform his listeners of the whereabouts of Sarah Palin. That's something everyone should know. Walter Crankcase was the Dan Rather of his day. I remember this particular report very well. I asked my mother if we were right wing. I was young and still trying to get all the categories straight. It was shortly after I'd come home from school asking if we were Jews or Republicans. BTW, Basil: this was a gem of a post! I would agree with the idea that Cronkite and Rather were lefty propagandists and should be forgotten about except for the fact that these ( at least Cronkite ) was my grandma's god. YOU DO NOT WANT TO CROSS MY GRANDMA'S GOD. Not if you want to have any type of life left. I learned quite early not to question Cronkite. What? He didn't blame the TEA Party? Couldn't The great Walter Cronkite foresee the future? ". . . And that's the way it is; depending on your definition of 'is,' . . . "